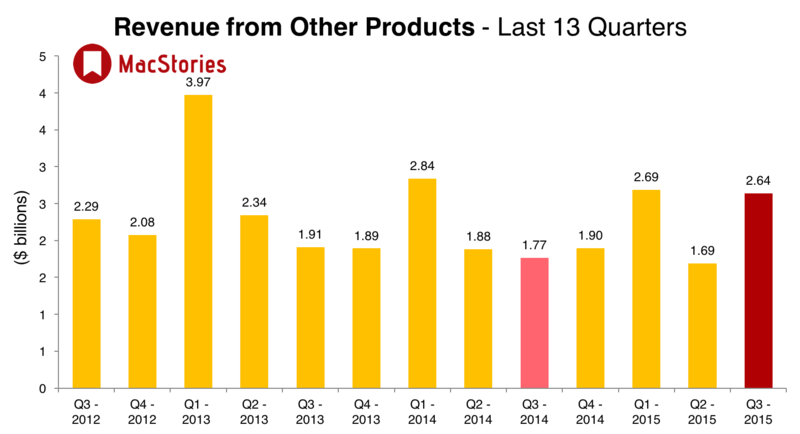 Apple has published their Q3 2015 financial results for the quarter that spanned from April to June 2015. The company posted revenue of $49.6 billion. The company sold 10.9 million iPads, 47.5 million iPhones, and 4.8 million Macs, earning a quarterly net profit of $10.7 billion. 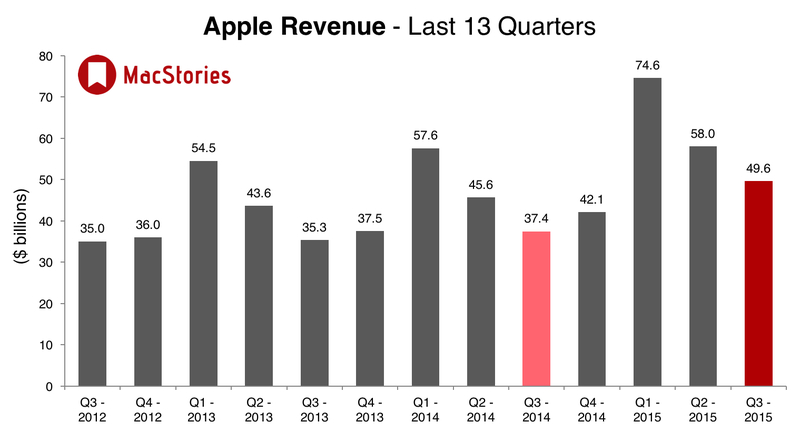 Apple's guidance for Q3 2015 fell between $46 billion and $48 billion. Fortune surveyed a number of institutional and independent Apple analysts, and found that the average prediction was for Apple to earn $50.61 billion in revenue and an earnings per share of $1.89. The analysts estimated that Apple sold 49.96 million iPhones, 10.64 million iPads, 4.82 million Macs and 4.03 million Watches in Q3 2015. 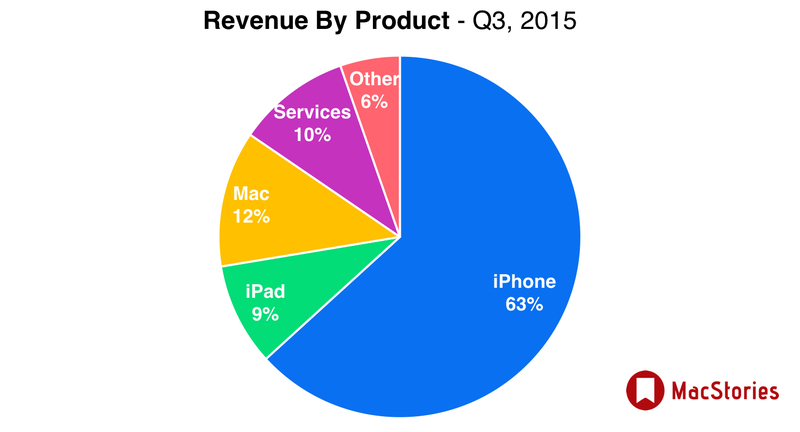 In the year ago quarter (Q3 2014), Apple earned $37.4 billion in revenue, and $9.5 billion in profit. 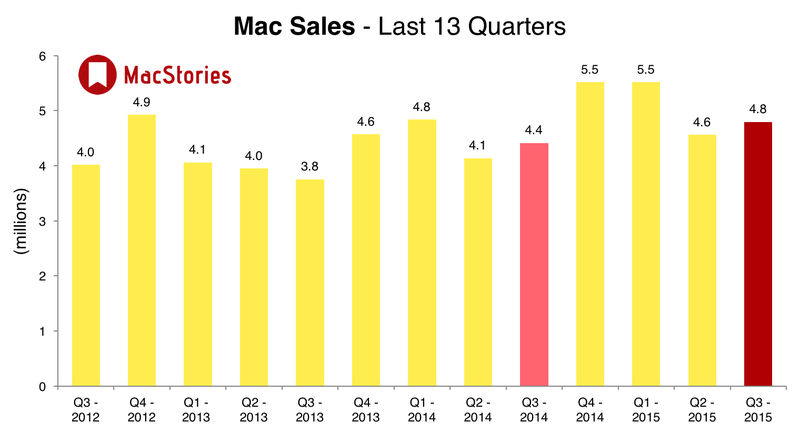 During that quarter Apple sold 35.2 million iPhones, 13.3 million iPads and 4.4 million Macs. Below, we've compiled a graphical visualization of Apple's Q3 2015 financial results. 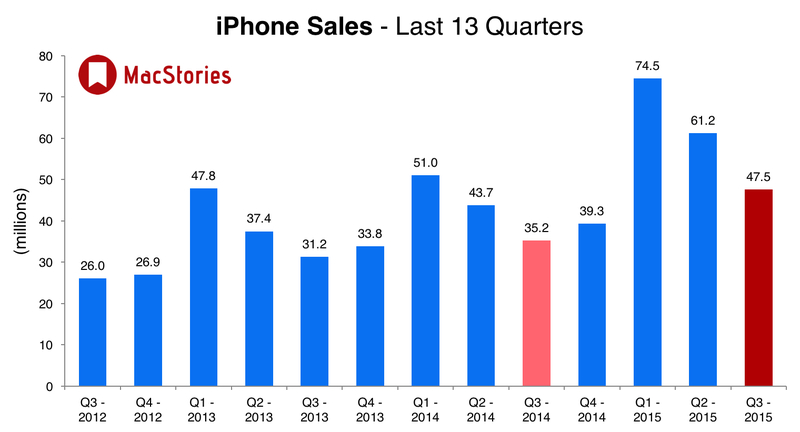 Apple achieved record results despite reducing channel inventory. iPhone unit sales grew over 35% and gained share in all geographical segments. Apple saw highest Android switcher rate ever as well. App Store revenue grew 24% in the quarter, reporting highest results ever. Apple Watch demand immediately exceeded supply and Apple delayed the availability in their own retail stores until mid June. Apple has now caught up with demand and Apple Watch is now available in 19 countries. Apple is very happy with customer satisfaction and usage statistics. Apple's own market research shows that 94% of Watch owners wear it and use it every day. 25 leading publishers have been signed for Apple News, including CNN, Bloomberg Business, The Daily Telegraph, and ESPN. "Millions and millions" of customers are already using Apple Music. 15,000 artists have signed up for Connect. Millions of listeners are enjoying Beats 1. American Express will add Apple Pay support for corporate cards next month. 700 universities in the US will soon accept Apple Pay. Apple is on track for Apple Pay acceptance in 1.5 million locations in the US by the end of 2015. 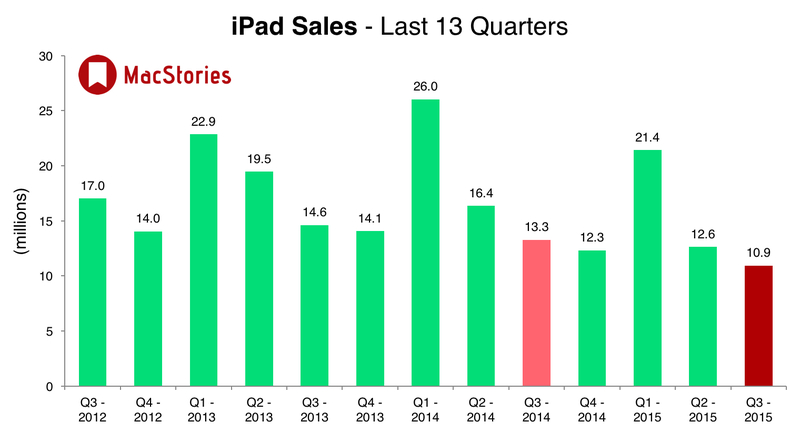 Apple doesn't participate in the low end of the tablet market, saying CFO Luca Maestri. 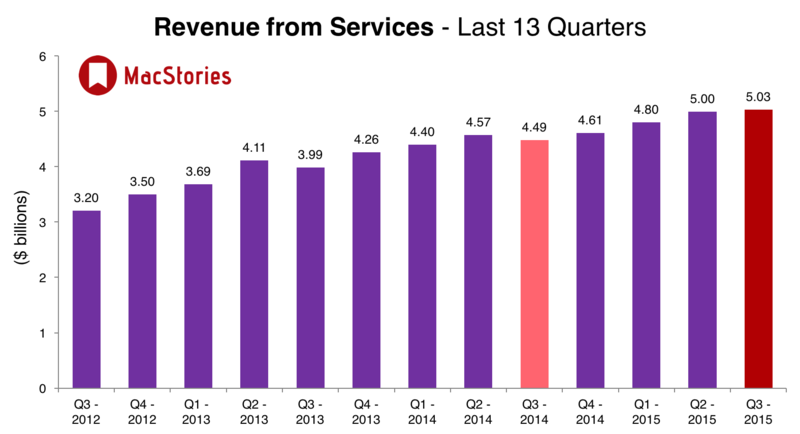 Services revenue has increased 12% over the past year. Services growth was strong in China where App Store revenue doubled year over year. 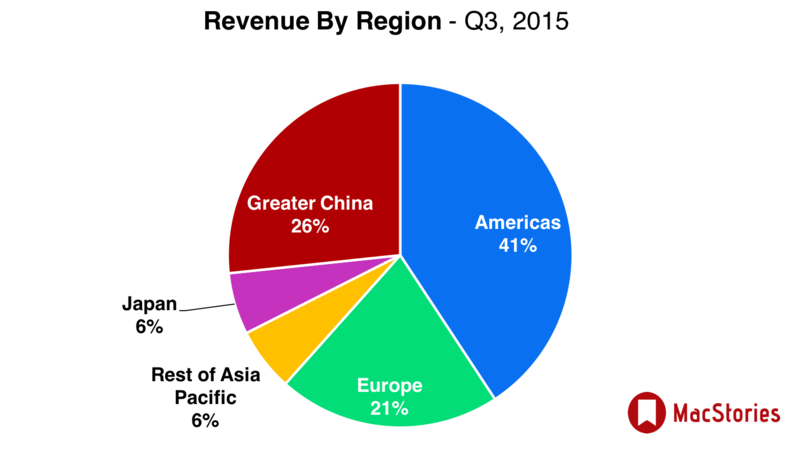 Apple Watch revenue accounted for over 100% growth in the Other category for the quarter. Tim Cook is very bullish on iPhone growth in the future given the headroom for Android switchers. The iPhone 6 Plus is doing well in Greater China and other Asian markets. The Apple Watch sell-through was higher than the same period for the original iPhone and iPad launches. Apple Watch sales have been higher in June than April or May. 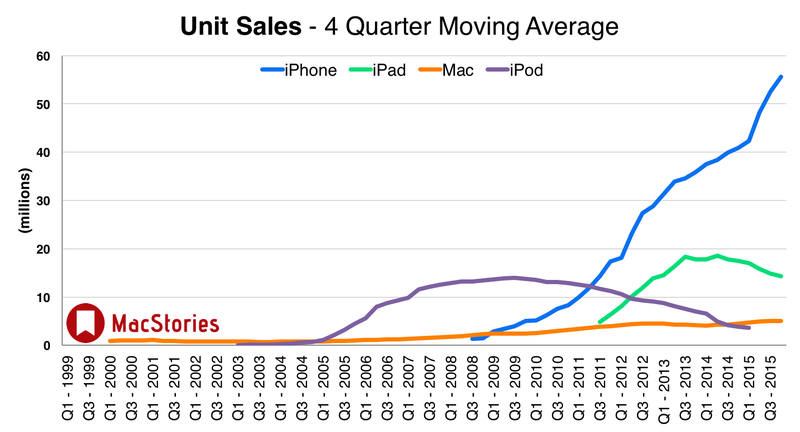 Apple posted record revenues while reducing channel inventory by 1M units across it’s devices. Efficiency is off the charts. So, let’s talk Watch. Apple said it would not reveal Watch unit sales, but in the “Other” category, revenues are up 49% year over year. “Other” was up $1B from last quarter. If Apple Watch ASP is $500, that’s 2 million watches. $2.6bn revenue in 'other services' — composing Apple Watch, Beats, iPod and Apple TV. CNBC: Tim Cook says iPhone continues to take market share. Only 27% of installed base has moved to iPhone 6/6 Plus.